Welcome to Dark Shadows Online! Click here to find the latest updates to Dark Shadows Online. PLUS: For more great DS info and photos, visit Stuart Manning's Dark Shadows Journal. 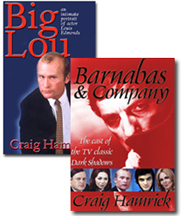 Please help support this site by buying webmaster Craig Hamrick's books at Barnes & Nobel.com. ATTENTION: To order the book or see information on the Updated/Revised edition of Barnabas & Company (c 2012) visit barnabasandcompany.com or contact co-author R. J. Jamison at rj@barnabasandcompany.com. It is with great sadness that I write that Craig Hamick passed away from colon cancer on September 24, 2006, just 15 days shy of his 40th birthday. I have been slow to post this news here, because I am not nearly as web savvy as Craig was. For those of you who have emailed with questions and thoughts about Dark Shadows, my apologies for not being back in touch. I check Craig's email account occasionally, but as you might imagine, it's difficult. I miss him. I promised Craig that I would somehow finish his update of Barnabas & Company, so please look for that new edition in Summer 2008. People from thoughout the Dark Shadows world have sent lovely thoughts and prayers, and I appreciate all of them. There may be a remembrance for Craig at the Dark Shadows event in August, so I hope that those who knew him and plan to attend the event in Tarrytown will participate. If you did not know Craig, he was an incredibly special person, with a unique outlook on life. I learned a lot from him in our 5 1/2 years together as partners. He inspired me, and continues to inspire me as an artist and as a human being. I am better at being both of those things because of the time we spent together. I intend to keep this site active for as long as I can as a resource on Dark Shadows. For specific questions and inquiries about the show not answered on this site, I would recommend visiting www.collinwood.net and inquiring there. • Barnabas Portrait Sells for $13,000! To the delight of a ballroom full of Dark Shadows fans, their favorite former vampire, Jonathan Frid, made a long-distance "appearance" at the 2006 Dark Shadows Festival on August 26, greeting them with a phone call broadcast over the speakers. The actor, who portrayed Barnabas Collins on DS, has retired to his hometown in Canada and hasn't attended a DS Festival in about a decade. While other cast members reunited on stage Saturday, Festival Chairman Jim Pierson placed a phone call from the podium, and the room erupted in wild applause and cries of "We love you!" as as the audience recognized a familiar voice. Jonathan sent his best wishes and joked that he'd been afraid he might not be able to connect with the fans because he was having problems dealing with his long distance/internet company--and he confessed that working on his website (www.jonathanfrid.com) consumed a huge amount of his time. An amazing array of great new merchandise was available, including brand new books by Lara Parker, Donna McKechnie, Diana Millay, Kathryn Leigh Scott, and Betsy Durkin; an audio book by Lara; a cabaret CD by Nancy Barrett, a new set of recorded audio dramas starring Lara, Kathryn, David Selby, and John Karlen -- plus Marie Wallace's career memoir and much more. 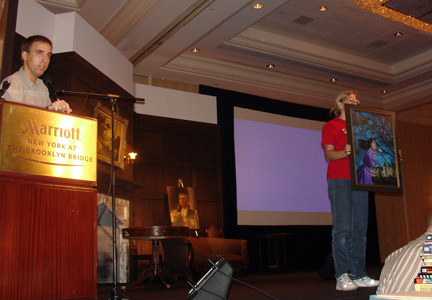 << The painting that was featured on the cover of the Paperback Library edition of Dark Shadows was auctioned on Saturday. Though I'd guessed it would go for four figures, it only fetched a surprising $700. 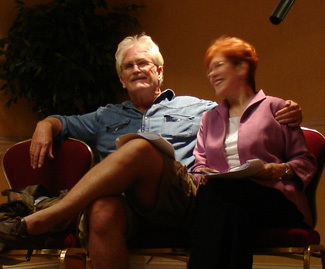 <<Chris Pennock and Donna Wandrey share a light moment during rehearsals for the DS re-enactments. (The only cameras there were mine, ShadowGram editor Marcy Robins', and of course Marie Wallace's, so you'll see some rare moments from the Sunday rehearsal session, here on DSO, soon! 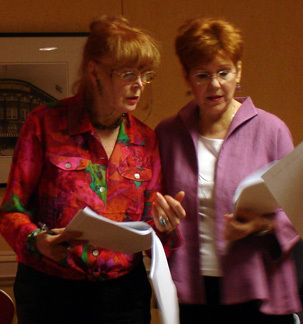 <<Also at the rehearsal, Marie Wallace and Donna Wandrey go over their scripts. <<Lovely Donna McKechnie was there Saturday, signing copies of her great new autobiography. <<Cast members of the DS re-enactments. 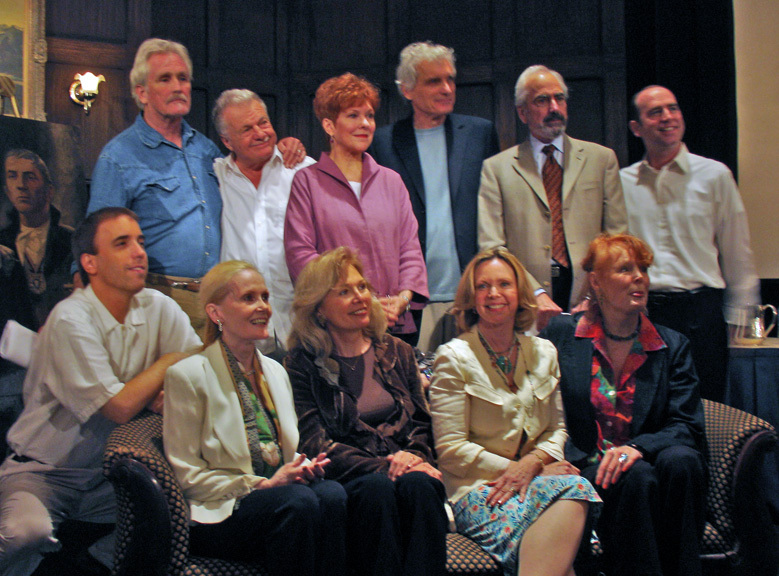 Back row: Chris Pennock, John Karlen, Donna Wandrey, David Selby, Jerry Lacy, and Richard Halperin. Front row: Jim Pierson, Nancy Barrett, Kathryn Leigh Scott, Lara Parker, and Marie Wallace. 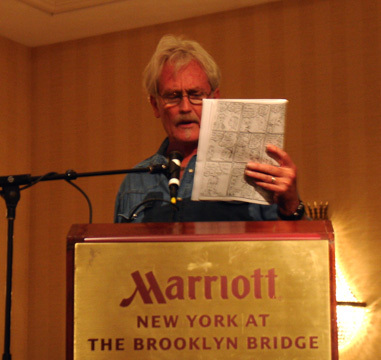 <<John Karlen and Lara Parker take questions from the audience. <<Nancy Barrett admires Lara Parker's necklace at the re-enactment rehearsal. 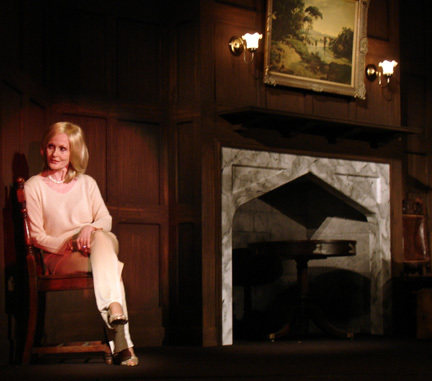 <<Nancy Barrett performs part of her musical show on a recreation of the Collinwood drawing room, which was on display the whole weekend. It was designed and created by Patrick De Blasi. More Festival Photos Coming Soon! Dark Shadows © Dan Curtis Productions. Dark Shadows Online: Site contents © 2006: Craig Hamrick. Email questions and comments to craig@craighamrick.com.